Hello everyone, I need your help. 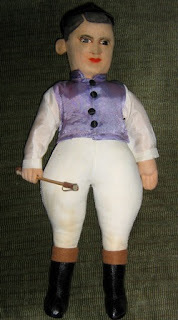 I have this cloth doll in my collection by the British manufacturer Allwin, I believe him to date from the 1930s. I think he is a famous Jockey, can anyone identify him or help me identify his racing colours? His cap is black, his shirt is purple with white sleeves and black buttons. Thank you for you time, I look forward to hearing your thoughts.